“So Carol, if you and Bob found exactly what you liked in one of our 6 estimates you wouldn’t be comfortable in calling to cancel the appointments with the other companies?” Joe replied. “I think if we saw exactly what we wanted we would be fine with canceling the other companies coming out but I find it difficult to believe that you are going to be able to give us exactly what we are looking for at the price we want. That’s just not usually how things work when we hire service contractors. That’s why we wanted to get multiple estimates,” Carol admitted. Customers getting multiple estimates creates a lot of negative energy. That negative energy takes all the air out of the room and leaves technicians feeling drained and defeated, all before the call has even started. The scenario described above is a true story that resulted in Bob and Carol moving forward with the call. It went from what was initially viewed in the tech’s mind as a “no opportunity call” to the possibility an opportunity might exist. The door was left open. Working these types of calls in this manner is a unique challenge and is not easy by any means. Although the value in learning to handle these types of calls, aside from the obvious possible outcome, is that when it comes time to do an easy call with no negativity, those calls will be a breeze. The idea of handling this type of tough call comes from two simple concepts, the first being to identify your negative assumption, and the second to confirm your negative assumption with the buyer. If you can achieve these two tasks, you will reveal your pure motive and your passion to get the job done, allowing them to open up and reveal what’s really going on in their minds too. Imagine your best sales or service people having the opportunity to spend an entire day learning strategies, mindset and techniques just like the one above, with Joe Crisara and the $7 million dollar residential HVAC-Plumbing & Electrical Replacement Service Advisor, Rick Picard. Think about it. What would a “day in the life” of the highest performing HVAC service advisor be like? It’d be like spending a day with Michael Jordan talking basketball, or talking about pitching with Nolan Ryan, or sitting down with Wayne Gretsky exploring hockey. In this case you and your service or sales people could spend the entire day with Rick and Joe. What if they (and you) had 1 day where every sales or service question is answered, every strategy is revealed and every problem your people face have a solution given to them? More importantly, they’d be forging a one-on-one relationship with the “Babe Ruth” of service contracting sales results. What would building a relationship with the top performer be worth to you and your team? Well wonder no more, that day is here! 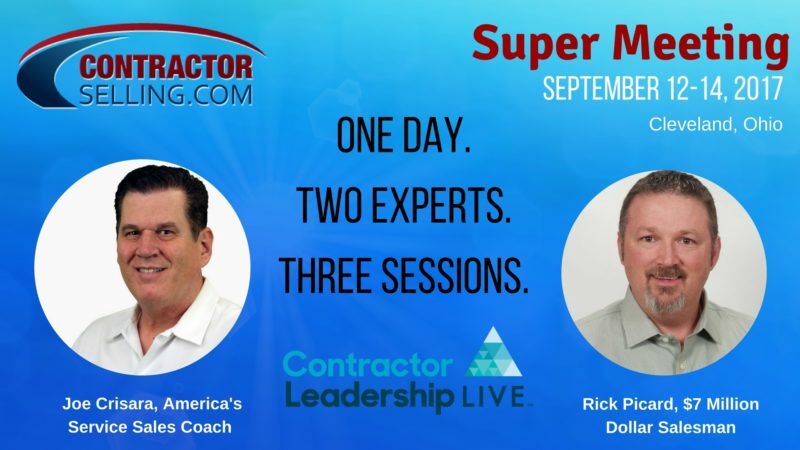 Rick Picard and Joe Crisara will host our ContractorSelling.com Super Meeting at Contractor Leadership Live in Cleveland, Ohio on Tuesday, September 12th for a day you don’t want to miss. A day that will live in history as perhaps the greatest game changer for you and your company. So to summarize, you get the entire day with Rick and Joe PLUS you get 3-day access to all the other learning sessions and the CLL exhibit hall all at one bonus price! It’s like getting two world class events with one ticket! PLUS , as I mentioned you get the over 50% bonus discount off your pass to this event as well! Again when you register to attend, to get the over 50% discount use the code: EGIA20. Early bird pricing lasts only until August 25th so sign up right now to get the best price. ​P.S. Rick and Joe can’t wait to meet, teach, mentor and learn with you that day. See you soon! P.S.S. We have arranged for you to get all the audio and videos from this day to have AFTER the day is over so you can listen to this timeless wisdom on your phone on the way home or in your truck between calls.